I’ve really been on a strawberry binge lately. I made an old-fashioned jello mold and a strawberry cobbler. I put some in the freezer for later, most likely for strawberry jam. And I’ve also made muffins! These delicious strawberry-lemon muffins to be exact. I really enjoy making muffins. They’re much easier than loaves and you get instant portion control! That’s always a plus for me. And although these do have a fair amount of sugar in them, I tried to make them a bit healthier by using part oatmeal and part whole wheat flour. We really enjoyed these and so, reportedly, did BeeBop’s co-workers. Preheat the oven to 375 degrees. Line a 12-cup muffin tin with paper liners. In a medium mixing bowl, combine the remaining ingredients, except the strawberries. Mix well. Stir the strawberries into the dry ingredient mixture. 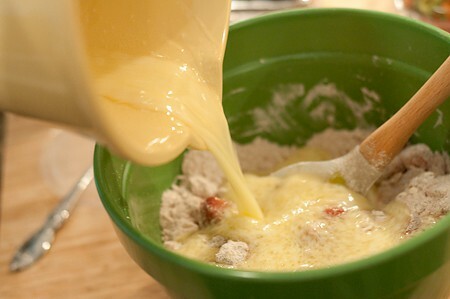 Add the wet ingredients to the dry ingredients, stirring just until moistened. Do not overmix. Fill muffin cups about 3/4 full. Sprinkle with the turbinado sugar. Bake 25 minutes or until a toothpick comes out clean. Cool on a rack for 10 minutes. Remove from muffin tin and allow to cool completely. 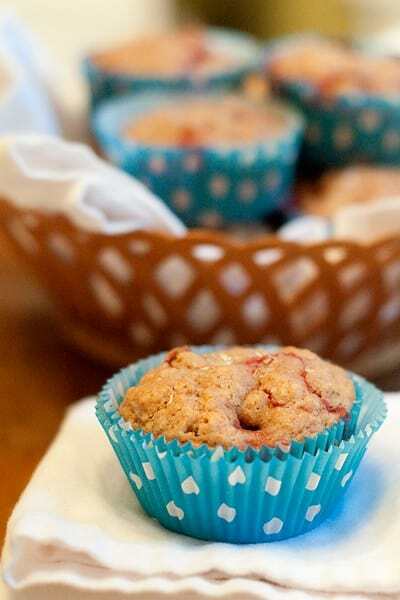 A whole wheat and oatmeal muffin with strawberry and lemon flavors. 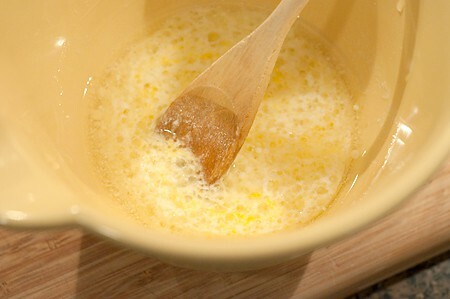 In a small mixing bowl, combine the oil, milk, egg, vanilla, and lemon juice. (Note: the lemon juice will cause the milk to curdle - this is fine). In a medium mixing bowl, combine the remaining ingredients, except the strawberries. Mix well. Stir the strawberries into the dry ingredient mixture. 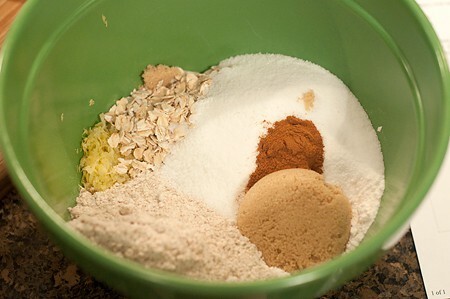 Add the wet ingredients to the dry ingredients, stirring just until moistened. Do not overmix. Fill muffin cups about 3/4 full. Sprinkle with the turbinado sugar. Bake 25 minutes or until a toothpick comes out clean. Cool on a rack for 10 minutes. Remove from muffin tin and allow to cool completely. Janet – it’s a large crystal, raw cane sugar. Here’s a link to a photo: http://www.walmart.com/ip/10292113?wmlspartner=wlpa&adid=22222222227009644362&wl0=&wl1=g&wl2=&wl3=18131319190&wl4=&wl5=pla&veh=sem You can just leave it off or substitute regular white sugar. Thanks, Denise. The strawberry and lemon combination is so good! I’m hoping to pick strawberries this weekend, and your muffins paired with lemon sound so refreshing for the hot weather! I love the u-pick strawberry patches! So much to choose each and every berry yourself, isn’t it? Thanks, Sues! I thought those wrappers were bright and cheery. Just makes your muffin a little more special, doesn’t it? These look and sound wonderful Lana! Strawberry picking season is running a little late here this year due to our unseasonably cold spring (or prolonged winter, whatever you want to call it!). I can’t wait until I can pick some fresh strawberries and make something delicious like this! Me too, Kelly. Muffins are so easy and so good! Hope you enjoy this one. I have been on a strawberry binge as well. And it looks like it’s going to continue, because I need these now! Hope you enjoy them, Deborah. Those look delicious. Just the right thing for an afternoon snack, with a tall cold glass of iced tea. It’s a great snack! One little muffin = just the right amount. This muffin screams “spring”, in the most lovely way! oh I just love the flavor of these!